Sometimes in life we swing the pendulum wildly from one course of action to the other. Such is the case with our relationship with the sun. For so many, the sun has become the bad guy…they are told their whole lives to cover up and not allow their skin exposure to the sun for fear of skin cancer as a result of the ultra-violet radiation. Their belief now is that the sun is an enemy…something to be avoided at all costs…something harmful.What was once a beautiful appreciation for the sun has turn into fear of these life giving and maintaining rays. But a very, very important component to sunlight has been overlooked in this over-zealous activity of bashing the sun. That important component is vitamin D. The old advice is now being updated to reflect the need the human body has for this very valuable vitamin and the sun is finally getting the credit it is due. Vitamin D is recognized worldwide as the sunshine vitamin so you would not expect a vitamin D deficiency epidemic but that’s exactly what there is. 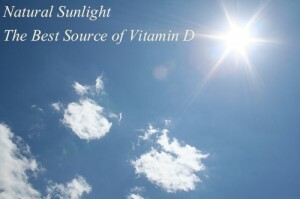 There is a large, growing list of diseases related to the deficiency of vitamin D in the diet. Bone diseases such as rickets, osteopenia and osteoporosis are all caused by this deficiency. Heart disease, breast cancer as well as other cancers like prostate and colon can be caused by a deficiency of this important sun vitamin as well. There are even more subtle contributions that Vitamin D gives us that protect us against depression and overactive immune systems as well as insomnia in those that have trouble sleeping. One of Vitamin D’s star roles is to keep bones healthy by increasing their absorption of calcium. This lack is called rickets in children and osteomalacia in adults. For the most part these diseases are now rare in the US, however there is another bone disease on the rise, osteoporosis…the bone disease that leads to spinal deformities and bone fractures. Without the proper amount of vitamin D the intestines cannot effectively and efficiently absorb the needed calcium. As bone calcium density falls to dangerous levels, bones become weak and are prone to fractures. But those issues seem minor when you compare them to cancer. Vitamin D is used to help regulate and maintain a healthy immune system, contributing to the normal growth and maturation of cells. This is why Vitamin D is an essential ally in the battle against cancer. Low levels can increase the risk of developing the dreaded disease cancer. To maintain healthy levels of Vitamin D go outdoors with 40-50 percent of skin exposed and get 20-30 minutes of direct sun each day whenever possible. For those living in areas that are a challenge due to weather, geography or other constraints, consider a vitamin D3 supplement. You can decrease your risk of cancer by more than half simply by optimizing your vitamin D levels with sun exposure. There is growing evidence that three-fourths of cancer patients suffer from vitamin D deficiency and that the lowest levels are found in those with advanced cancers. We must get over our fear of the sun as there are more lives lost to diseases every year that were caused by a lack of sunlight than were caused by too much sunlight. Vitamin D is essential to your health and you cannot be healthy without proper levels. “Just Say No to Cancer”; no one deserves the burden of cancer…not even the most hardened criminal.